Do you dream about beautiful kitchens in beautiful houses? I know that I cannot be the only one. 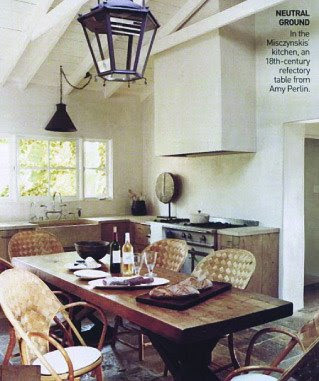 This gorgeous kitchen space, featured in Vogue, inspires dreams of relaxing dinners and enchanting conversations. It inspires me to make my weekend the best weekend possible, and to embrace everything that it has to offer and every journey that it allows. I am so looking forward to this upcoming long weekend, away from the office and the hustle and bustle of city life, to enjoy errands with Josh and soaking up every moment of time spent with him and Nash, and to spending some long overdue time with close friends. This weekend will be productive, relaxing, and everything that dream weekends are made of: love, laughs and adventure. A reminder to be grateful that I never have to deal with roommates again from with a C.H. You know, I don't often see kitchens that I like (crazy I know), but I do really like this one! It doesn't look like everything else in any way. It's light and airy, doesn't seem to be blindly following trends (unless you count the sink and the viking stove ... ), but really has a different look. It certainly looks european, doesn't it? I found your blog via Elise's blog, and I just wanted to say that I hope you enjoy your wonderful long weekend. I love the table in that kitchen!